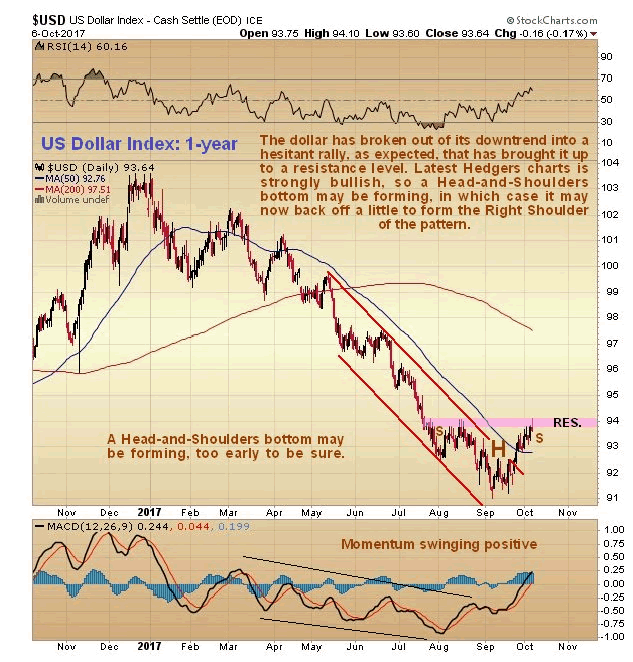 Are Gold and the US Dollar Rallying Together? Technical analyst Clive Maund examines the relationship between the dollar and precious metals.The last gold Market update almost a month ago called the intermediate top within a day, as you may recall, and the subsequent Gold and U.S. Dollar called the rally in the dollar the day before it started. Having seen a significant reaction back by gold, the question now is "Has it run its course?" 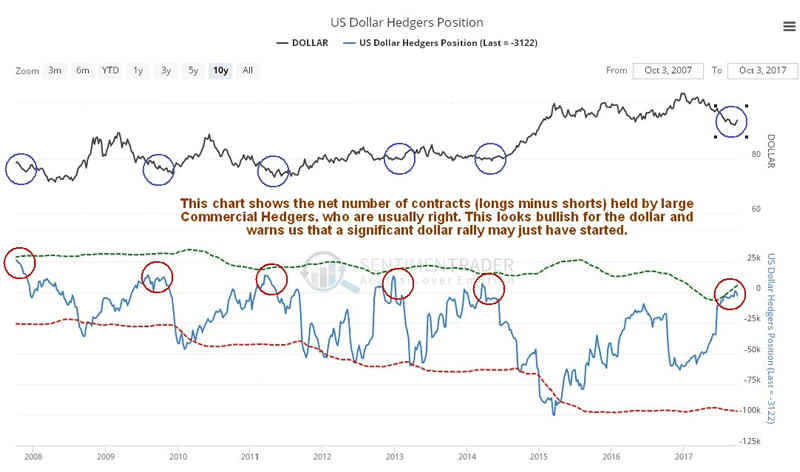 The short answer to that is yes, although calling a bottom here is complicated by the fact that gold's COTs have not eased as much on the reaction as we might have expected, and the dollar Hedgers' chart is still flat out bullish for the dollar. 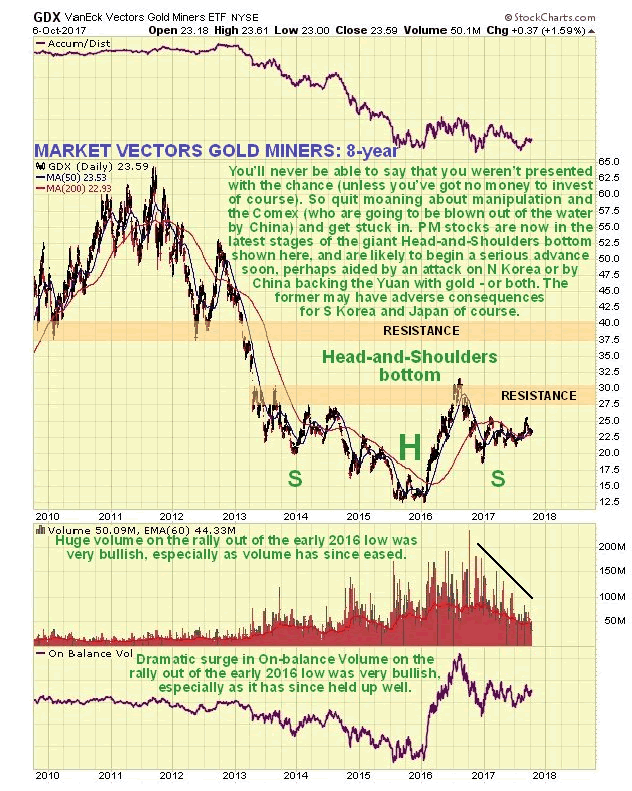 What this means is that we may need to see some bottoming action by gold, even if it soon breaks out of its rather steep short-term downtrend, and another possibility that we will examine is that the dollar and gold rally in tandem, a rare circumstance that could be occasioned by an extreme development such as an attack on North Korea, although if this happens the peoples of Seoul and Tokyo will doubtless have more important things to think about than the price of gold. On gold's latest 6-month chart we can see how the reaction of recent weeks has retraced about 50% of the prior rally, as tensions with North Korea have temporarily eased. 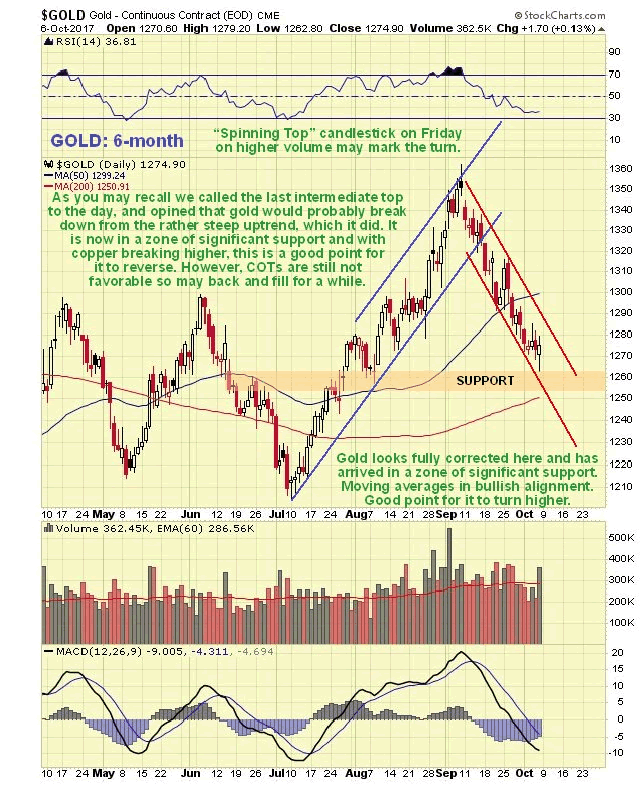 This reaction has more than fully corrected the overbought condition resulting from the rally, and has brought gold back into a zone of significant support just above its rising 200-day moving average, and with moving averages in bullish alignment, conditions generally favor a reversal and rally. The "spinning top" candlestick that occurred on Friday on increased volume may mark the turn, although the candlesticks that occurred on the charts for silver and silver proxies look like more convincing reversals. 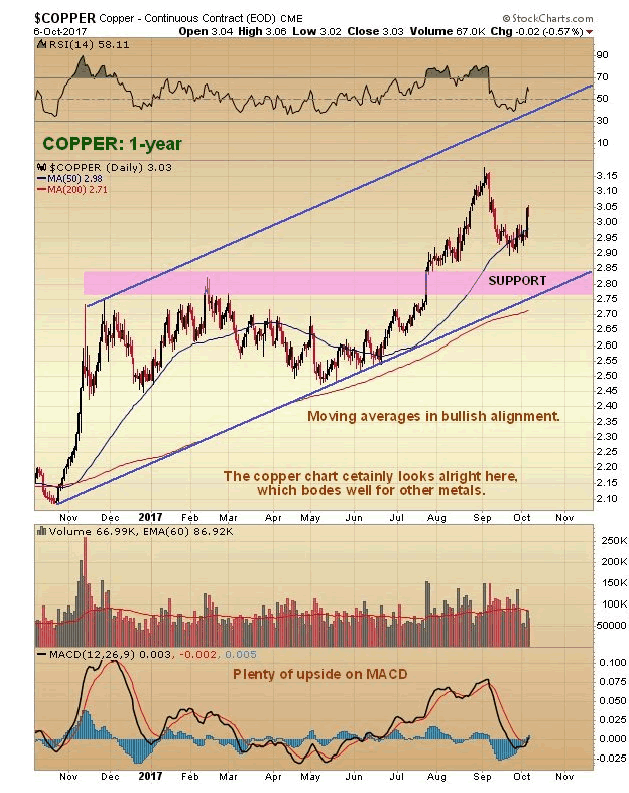 Given that copper tends to lead other metals as it did on the last rally, this could well be followed by gold and silver reversing to the upside after their reaction back to support, despite the dollar looking like it has further to rally. Another positive factor for gold and silver is that there was a full moon late last week and the Precious Metals often reverse on either the new or full moon, although astrologically silver is ruled by the moon and gold by the sun, which may explain why the Incas, famous for their gold, worshiped the sun – which makes a lot more sense than many of the other things that get worshiped. If you think that is wacky, try this for size—eclipses are thought by many astrologers to be a baleful omen, and you may recall that on August 21st a total eclipse of the sun slashed right across the U.S. from coast to coast. Soon after, the country was clobbered by a succession of natural disasters, in addition to Donald Trump’s Tweetstorms, with three massively destructive hurricanes impacting Texas, then Florida, and lastly Puerto Rico. Coincidence? I think not. On gold's 8-year chart it continues to look like it is in the late stages of a giant Head-and-Shoulders bottom pattern. The buildup in volume over past 20 months certainly looks positive, especially over the past several months, all the more so because it has driven volume indicators higher, notably the Accum-Distrib line, which is not far off making new highs—exceeding its level at the 2011 peak. Once gold breaks above the resistance level approaching $1400 it will be on its way, although it will then have to contend another important band of resistance in the $1510 - $1560 range. 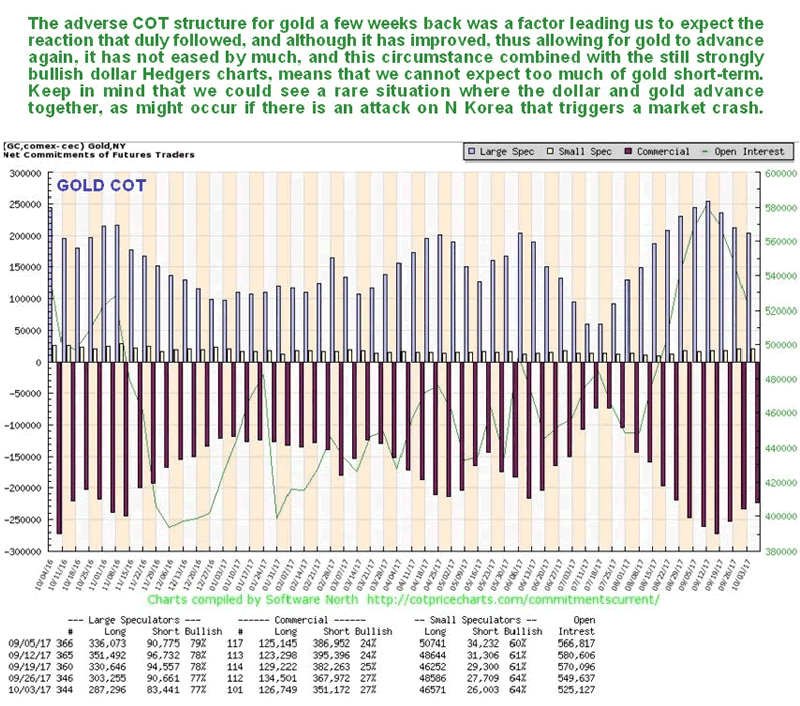 The latest COT chart for gold shows that, while positions have certainly eased on the reaction of recent weeks, they have not eased by as much as one would expect, which sounds a cautionary note and suggests that a rally now may be stunted, and followed by more basing action before a larger uptrend can gain traction. This accords with what we are seeing on the dollar charts, especially the latest dollar Hedgers' chart.